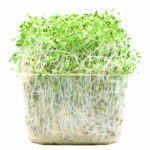 According to The U.S. Centers for Disease Control and Prevention (CDC) , their investigation of this latest Salmonella outbreak indicates that alfalfa sprouts supplied by Sprouts Extraordinaire of Denver, Colorado, are the likely source. At this point, thirty people have been sickened. Since 1984, Attorney Eric H. Weinberg has assisted personal injury victims, including those injured in Salmonella food poisoning outbreaks. If you have been injured, call the Weinberg Law Firm at 1-877-934-6274 or fill out our Free Legal Case Evaluation Form found on this page. Thirty people infected with the outbreak strains of Salmonella Reading and/or Salmonella Abony have been reported from nine states as follows: Colorado (13), Kansas (8), Minnesota (1), Missouri (1), Nebraska (2), New York (1), Oregon (1), Texas (1), and Wyoming (2). Five of those sickened were hospitalized. Illness onset dates range from May 21, 2016 to July 20, 2016. Outbreak victims reported eating raw alfalfa sprouts on sandwiches from multiple different restaurants. Public health traceback investigations of five restaurants where ill people reported eating alfalfa sprouts, indicated that Sprouts Extraordinaire supplied alfalfa sprouts to all five of these locations. According to the U. S. Centers for Disease Control and Prevention (CDC) there are an estimated 1.2 million cases in the U.S. each year, with approximately 400 of those cases resulting in death. The elderly, infants, and those with impaired immune systems are more likely to suffer severe illness or Salmonella complications. Symptoms of Salmonella food poisoning (salmonellosis) may include diarrhea (sometimes bloody), abdominal cramps, nausea, vomiting, fever, chills, headache, muscle pain, and joint pain. Symptoms usually appear within 6 to 72 hours after eating a Salmonella contaminated food. In a small percentage of patients, a condition known as reactive arthritis may develop. Reactive arthritis is characterized by joint pain, eye irritation (conjunctivitis), and/or painful urination. Reactive arthritis symptoms may appear from 1-4 weeks following infection.